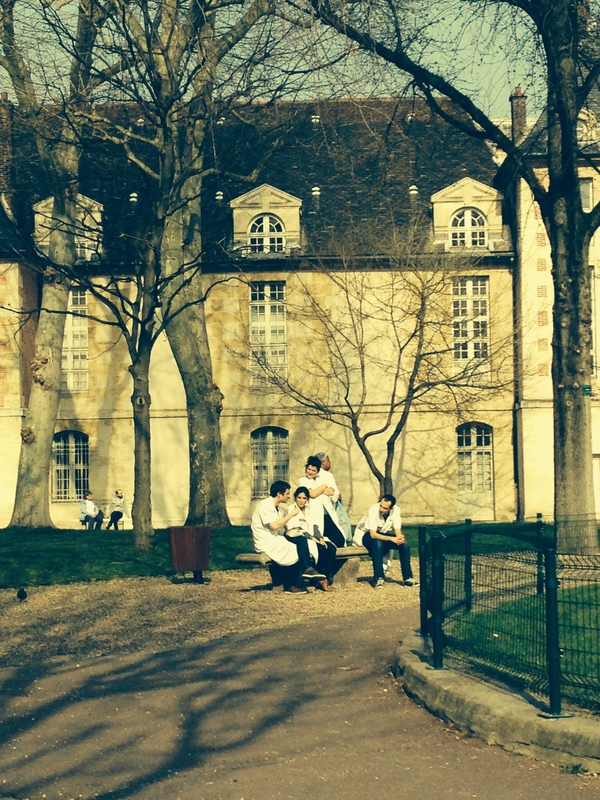 Paris, I will love you always, but you have a rival: Bordeaux. 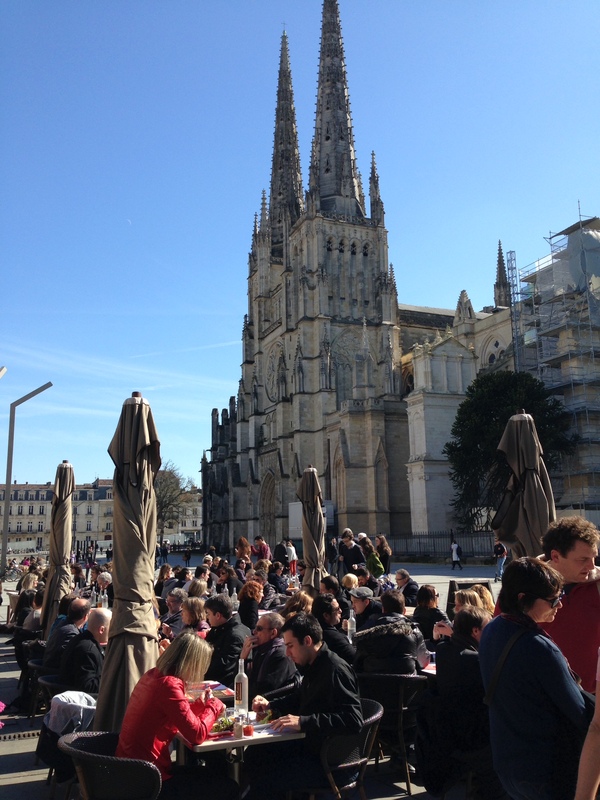 Capital of Aquitaine, a port city and Unesco heritage site, this rival for my affections has so much going for it. Where to begin? 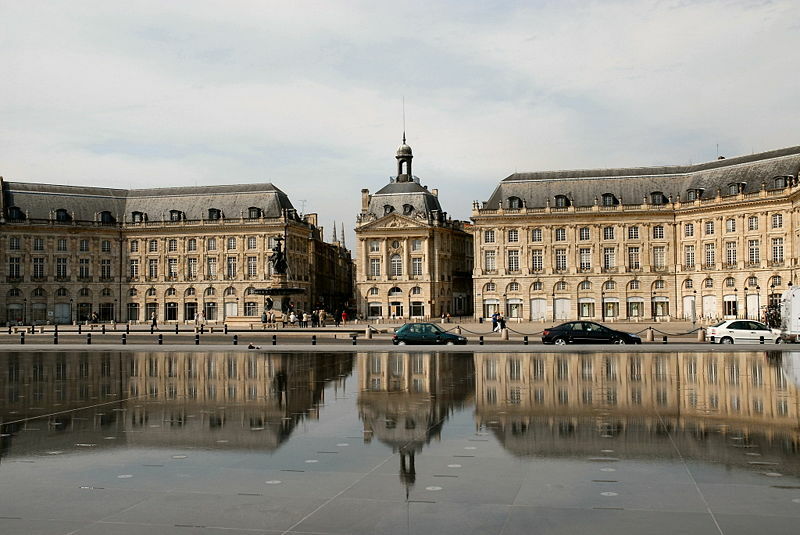 Bordeaux’s port offers a mile or more of riverfront mansions,that date to the 18th century. The beige stones of their facades are reflected in the soft light that bounces off the River Garonne . This thrilling run of beautiful buildings is not interrupted by anything ugly. 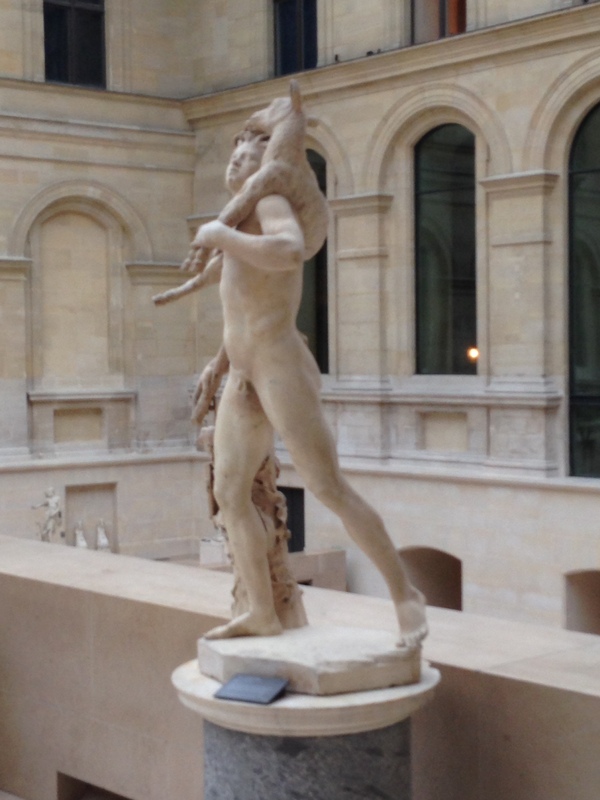 This is the first smart French idea for today’s post: when you build something beautiful, don’t mess it up. 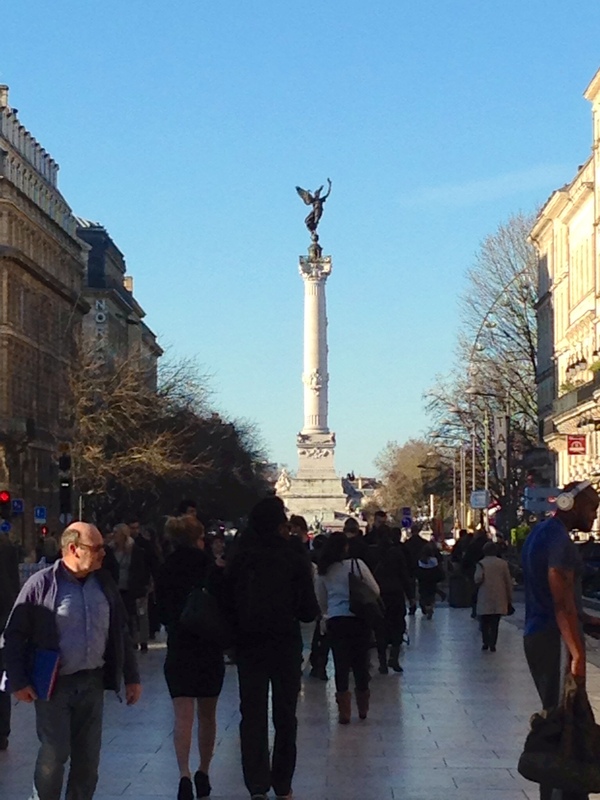 The historic city centre resembles Paris, the Hausmannian part, with massive carved stone buildings and wide boulevards. It is all familiar to a Paris lover, in a very good way. There is also a beautiful medieval cathedral, to rival those in Paris and Chartes. But, while la vie Bordelaise has much in common with the good life in other French cities, they have implemented an idea that is really different and really smart. The entire city core is traffic-free. All pedestrian, no cars. It makes you feel like this. 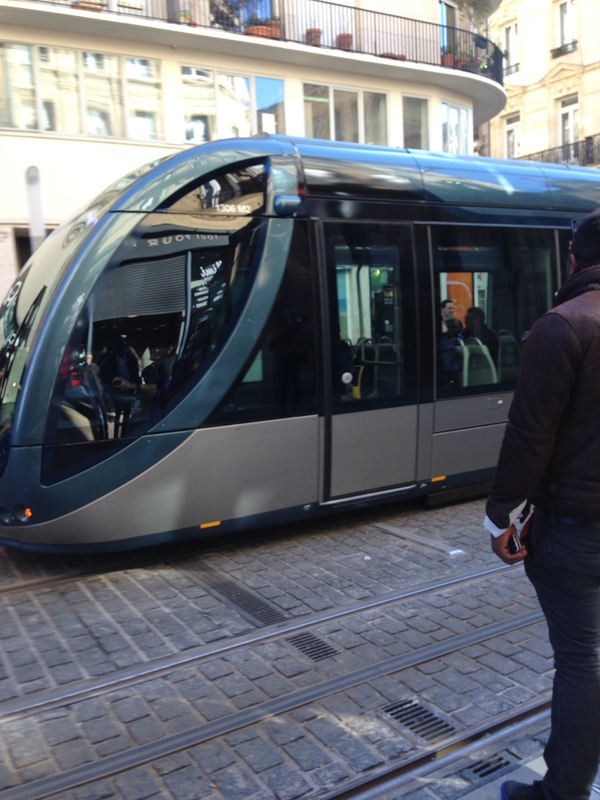 Silent electric trams offer pedestrians an alternative to walking. 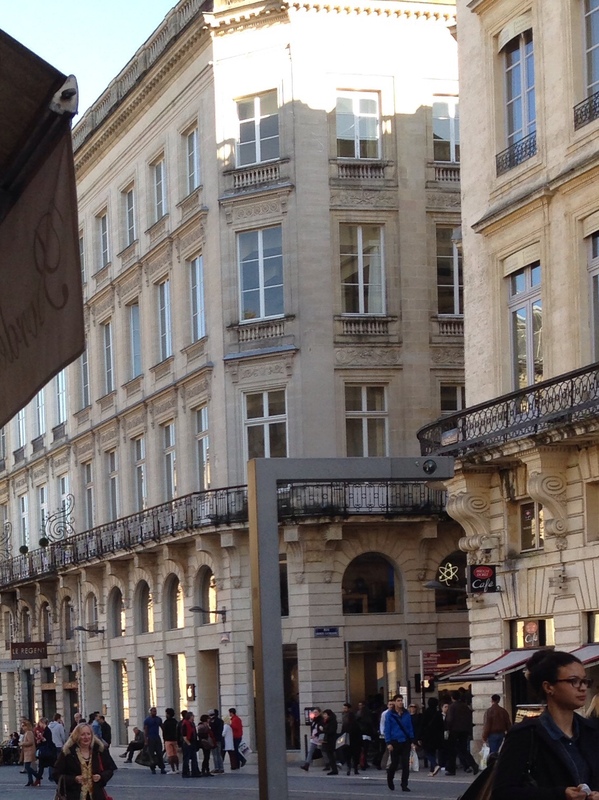 The air of Bordeaux is so clean and breathable. Without traffic,it is so much quieter than other cities. And so much more relaxing: you are strolling without having to be vigilant about cars. I have never experienced this in a city centre. Have you? 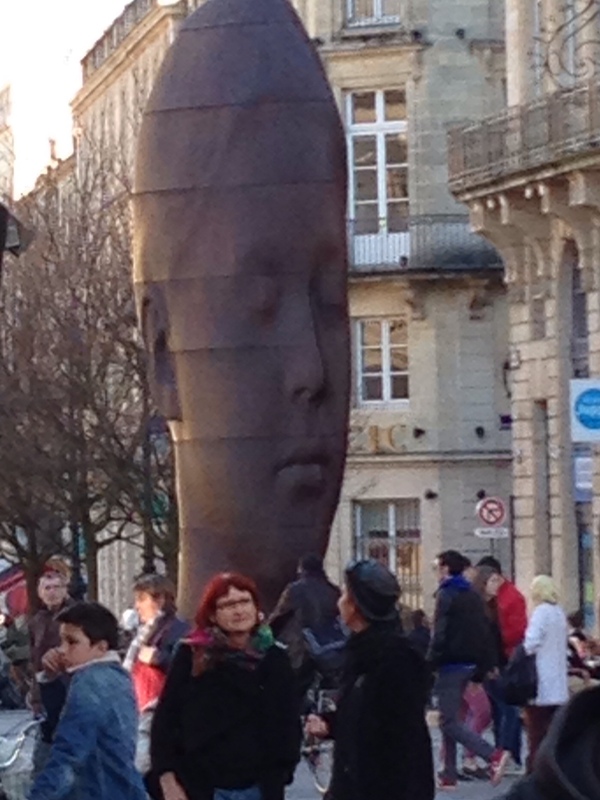 Another smart idea, this time one also adopted by Paris, the presence of public sculpture. Cool, isn’t it? If you go past on the right, you think it’s an abstract sculpture, still very nice. It’s only from this angle you see the face. 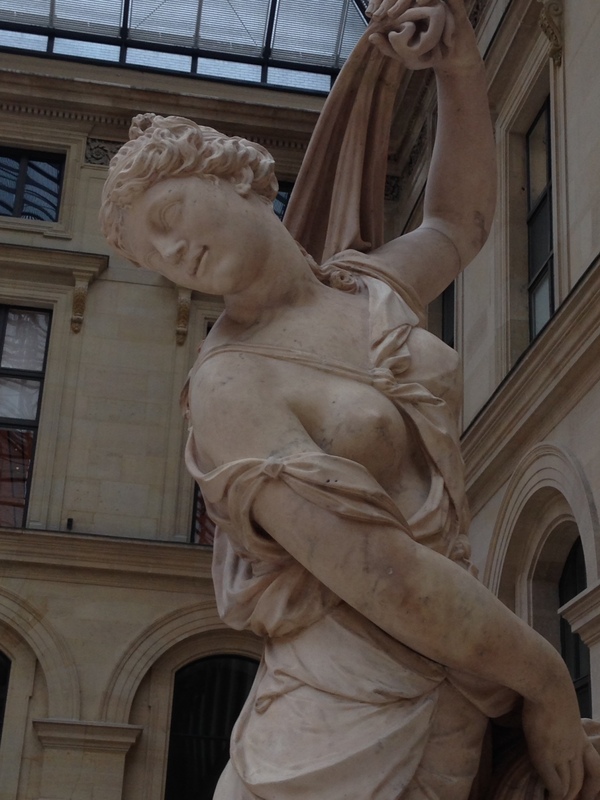 Why don’t we have public sculpture everywhere in our cities? It makes the city experience so much more vibrant and enjoyable. Here’s a modest proposal. How about we take 1% of every construction project that gets approval and put it into public art? PInk socks. For men. Not a good idea. In my first week over here I was at a dinner party of distinguished Parisians, and the 60-ish man introduced as an important art expert was wearing pink socks. 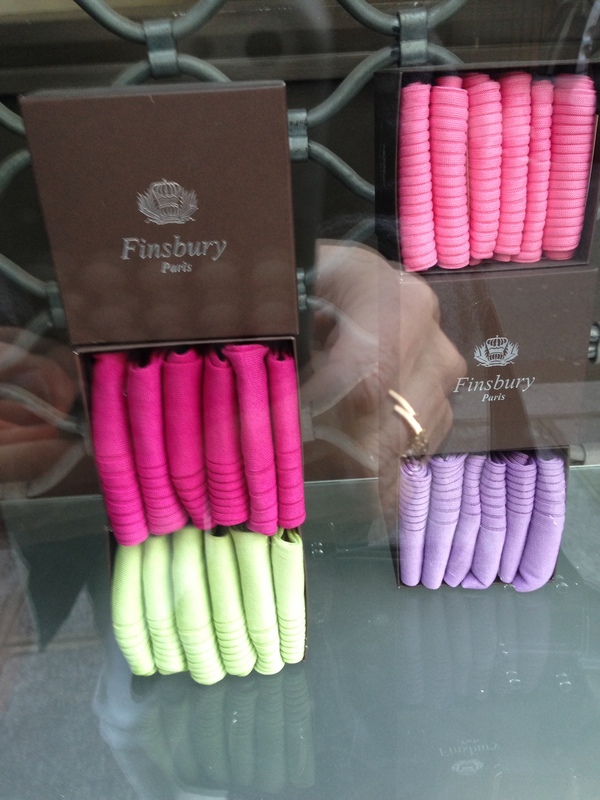 Then I started seeing them in vitrines throughout the city. I personally am not ready for this. It is not a gay thing. I can’t imagine my gay friends wearing pink socks. For example, my friend Jordan, who occasionally sports bright blue hair, would not be seen in pink socks. Neither would I. 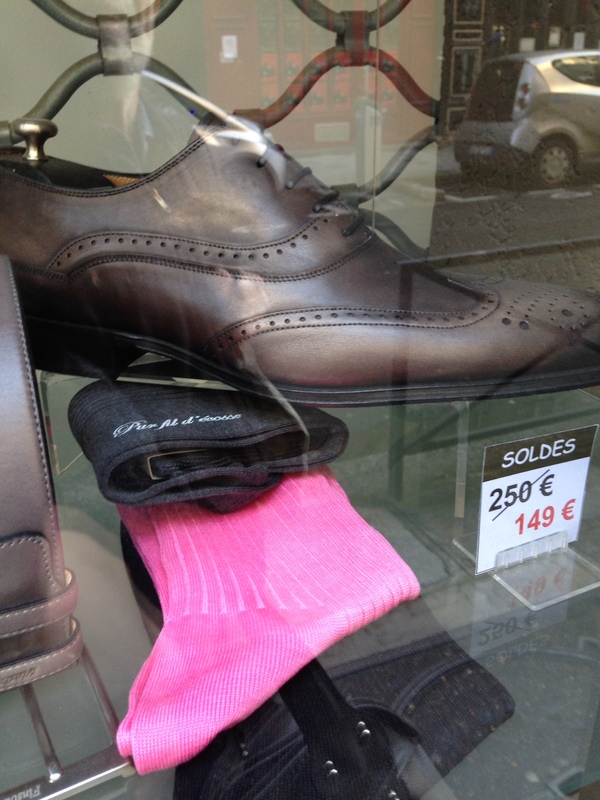 If you are older than ten years of age you should not wear pink socks. Phew, glad I got that off my chest. More seriously, here’s another idea that is not very good: sunbathing. 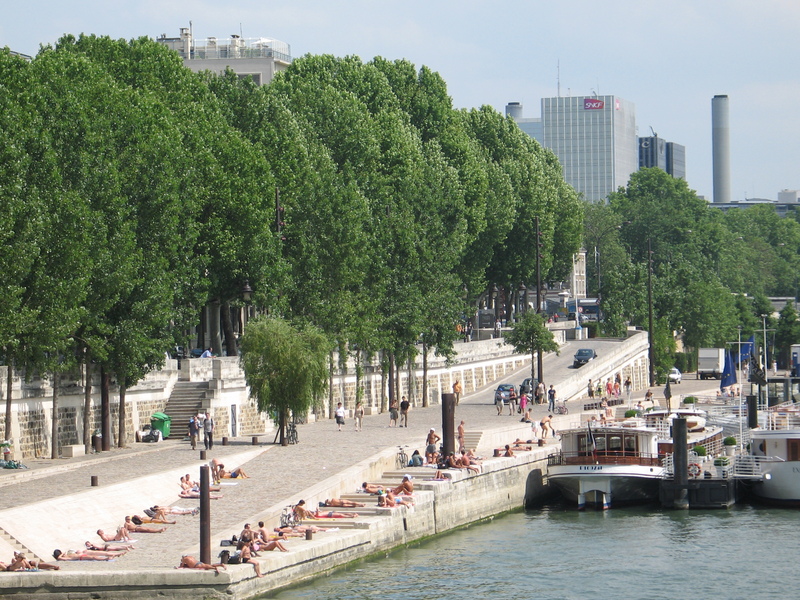 No one seems to have explained to the Parisians about the dangers of sunbathing. There they are, everywhere, upturned faces, taking the rays. This practice is not good and health authorities should take action to inform the public. As I’m sure these doctors will do, once they stop taking the sun. 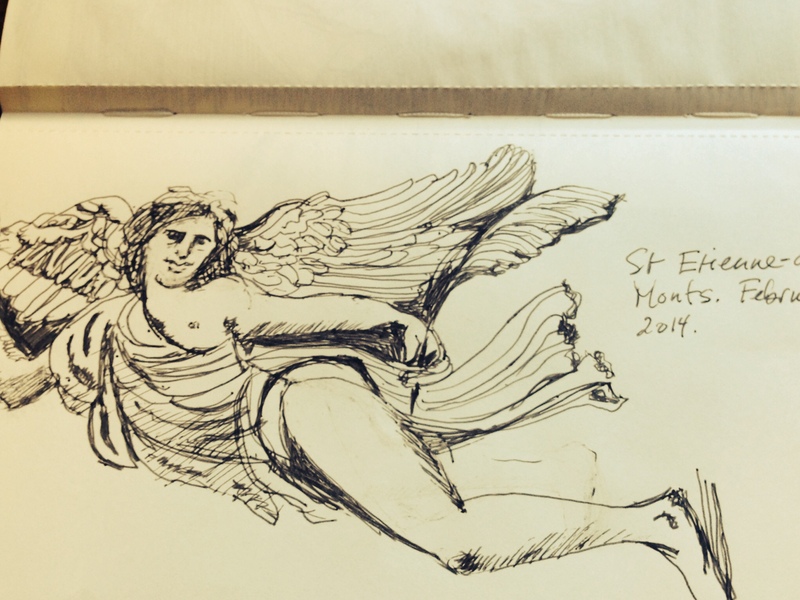 From the sketchbook this week, an angel, who appears as part of the beautiful rood screen of the church, St. Etienne des Monts. Enjoy. 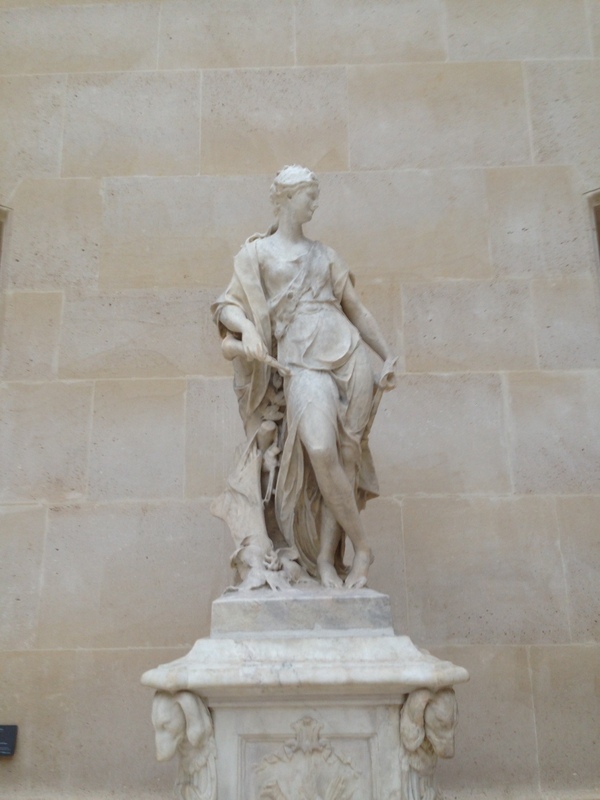 On my first trip to Paris I was twenty and in the company of my mother. I had just enough education and maturity to appreciate what I was seeing and in our whirlwind three days I resolved repeatedly to come back. 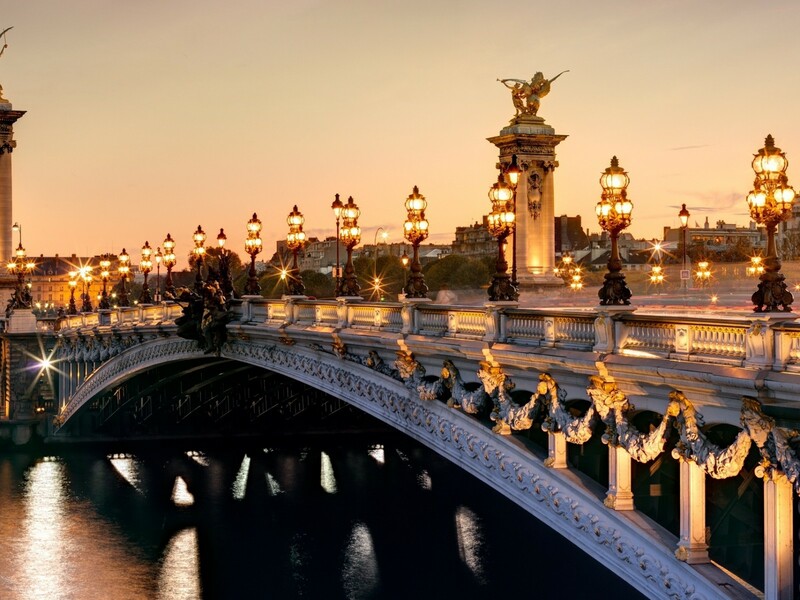 Vividly, I remember standing on Pont Alexandre III and vowing that some day I would come back with the love of my life. It only took twenty or so years, and a lot of living: a marriage, a career, years of schooling, children, a divorce, and then finding Alan. We came for a week that first time all the while hungry for more. A few years later, we did, for a six month sabbatical. Kids, dogs and many friends and family members came along for the ride. . Again, we knew we would be back and now it’s just the two of us. Time for a leetle romance, no (use your best PePe le Pieu accent)? 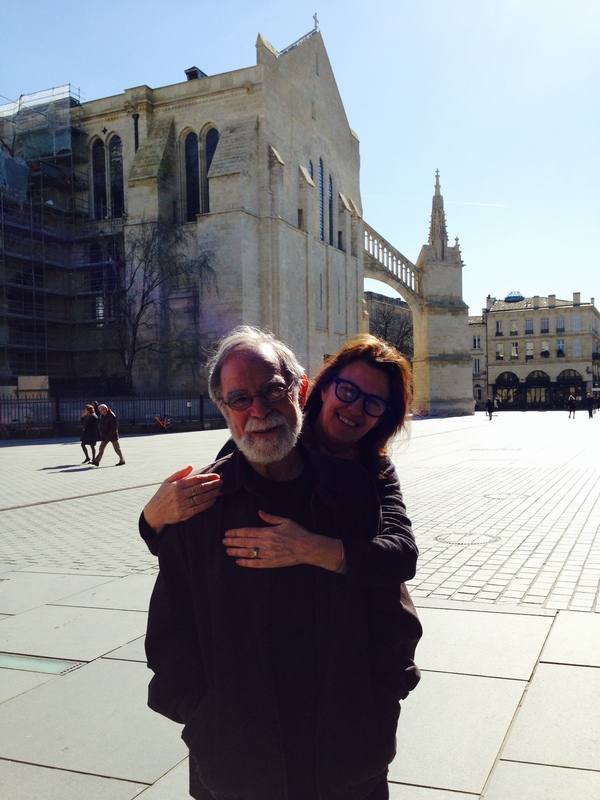 We decided to have an early Valentine’s and what is the best thing to do for a romantic sortie in the City of Love? 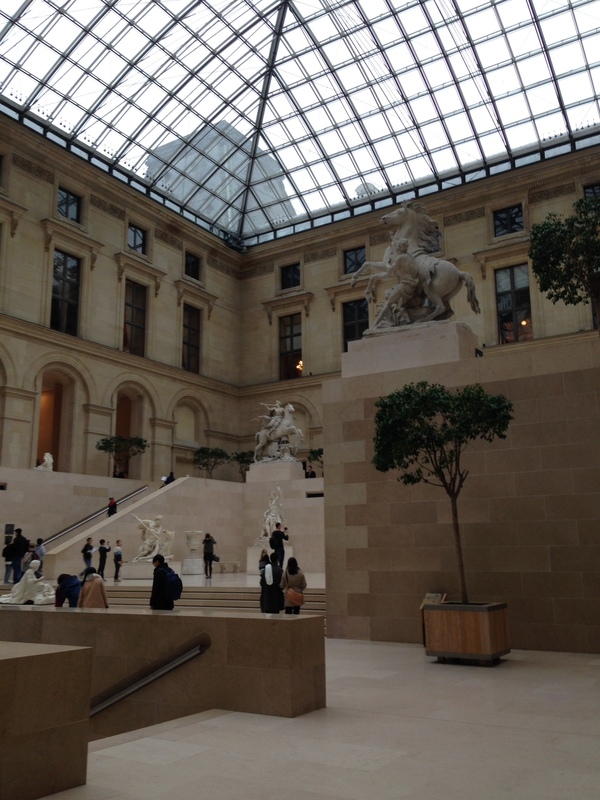 For starters, walk along the Seine holding hands, then go to the Louvre and share wonderful art. Did you notice how I snuck another boar into this? 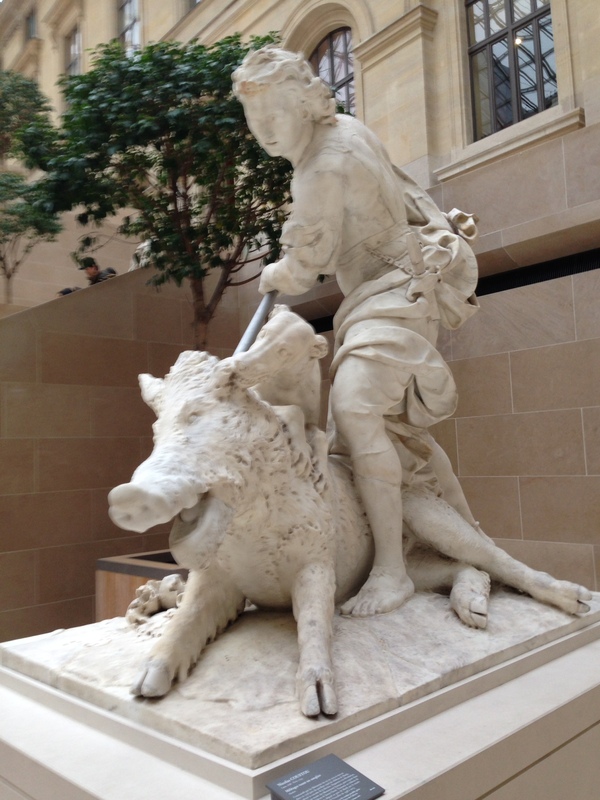 I’m going to go back and draw that boar. He is so wonderful under the vast skylight. 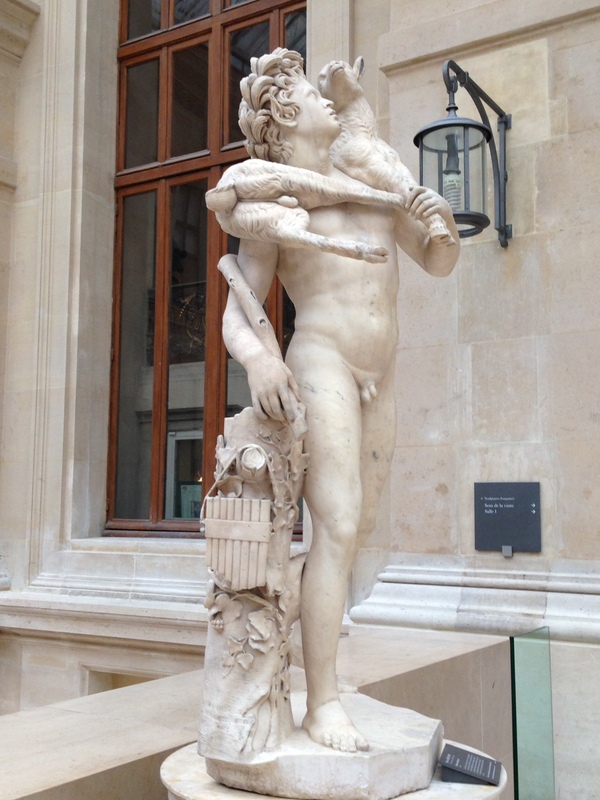 I love a sculpture court since they create a whole alternative world of stone, and they remind me of Narnia. 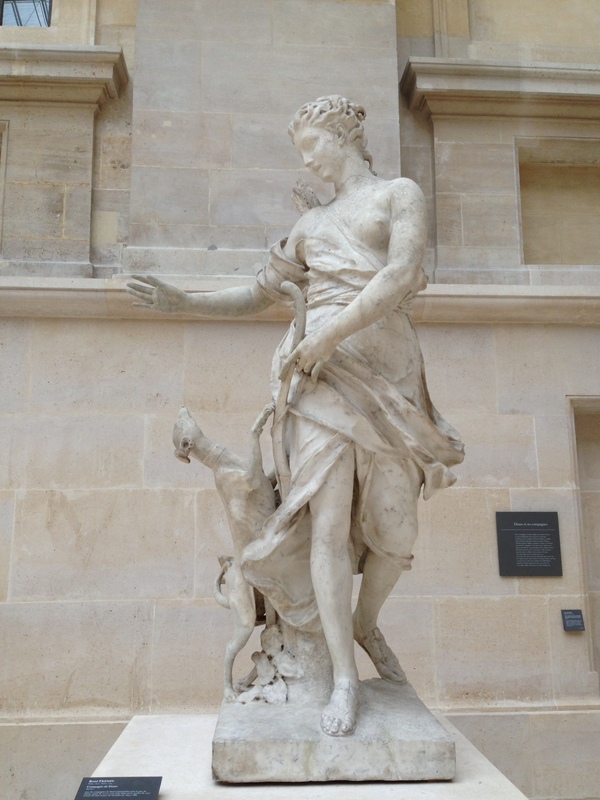 The French Sculpture court is non-pareil, and what a marvel indeed, were these creatures to come to life. 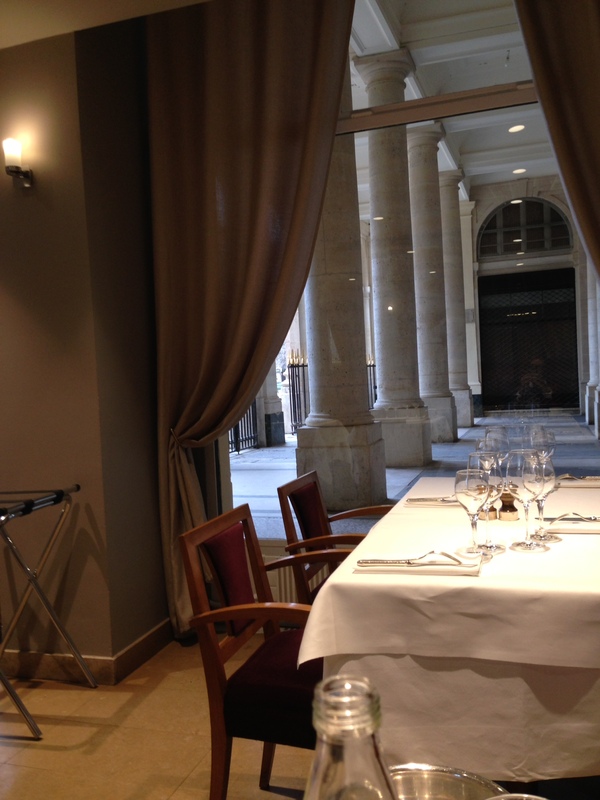 Continuing on the Valentine’s agenda, we left the Louvre and strolled across the rue de Rivoli to the Jardin du Place Royale, where a perfect heaven of gustatory delight is tucked into the corner off the arcade. Here, cordial waiters bring you your hearts’ desire. 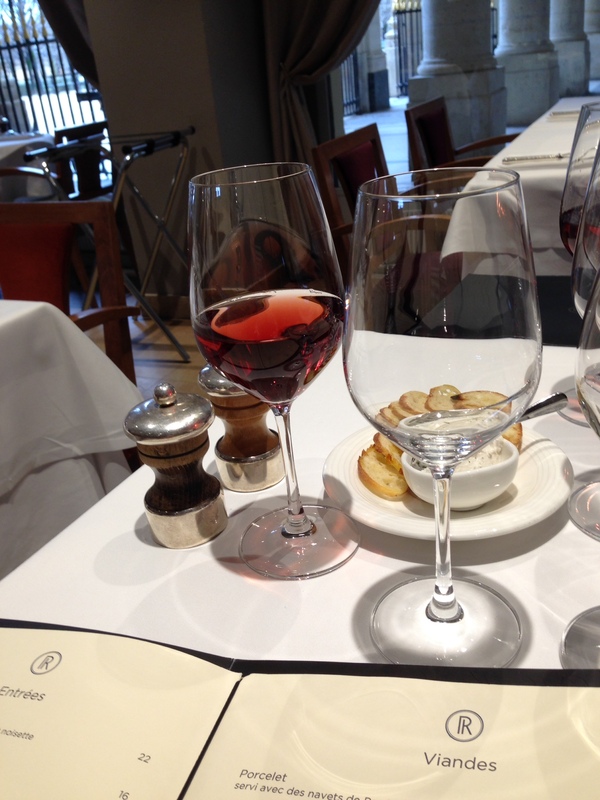 Perhaps a Kir, while we consider the menu? 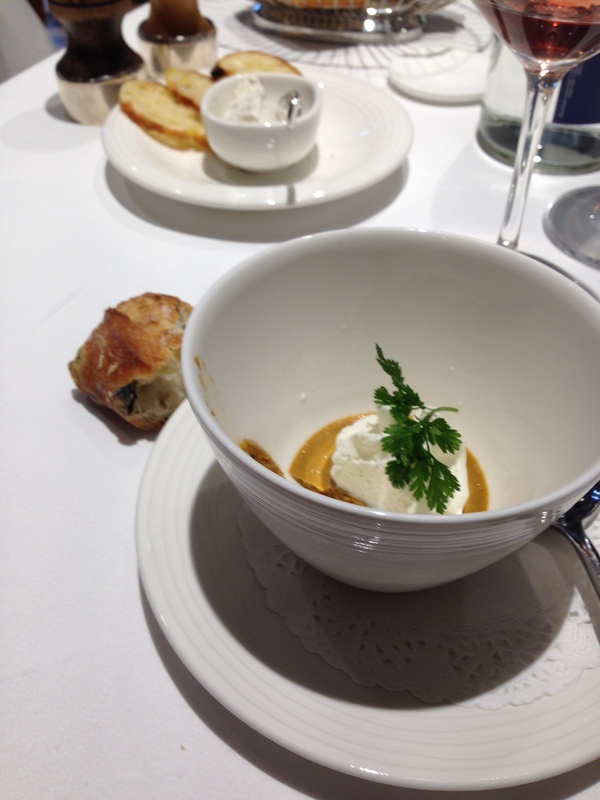 Maybe an amuse-bouche of cold essence of lobster with creme chantilly. My mouth is very amused indeed. 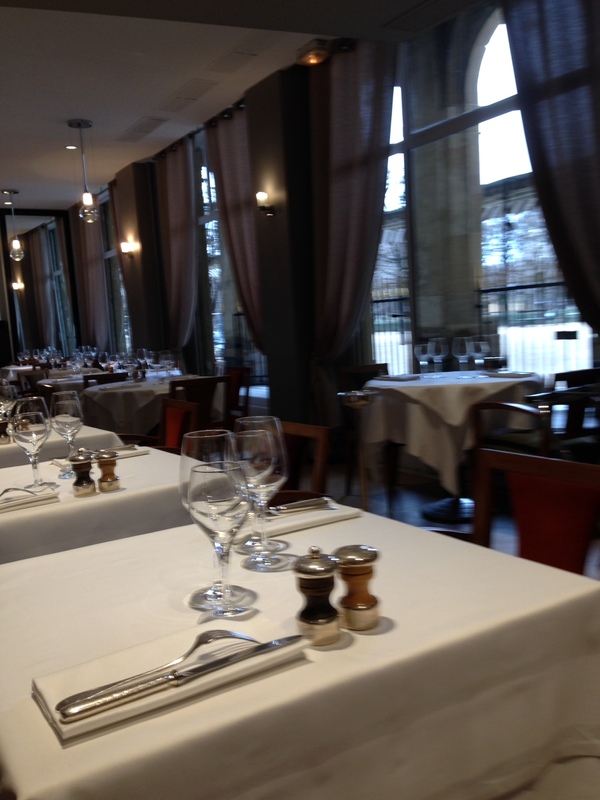 We enjoy the special quality of the light in the arcade while we dine on oysters, risotto and lamb. 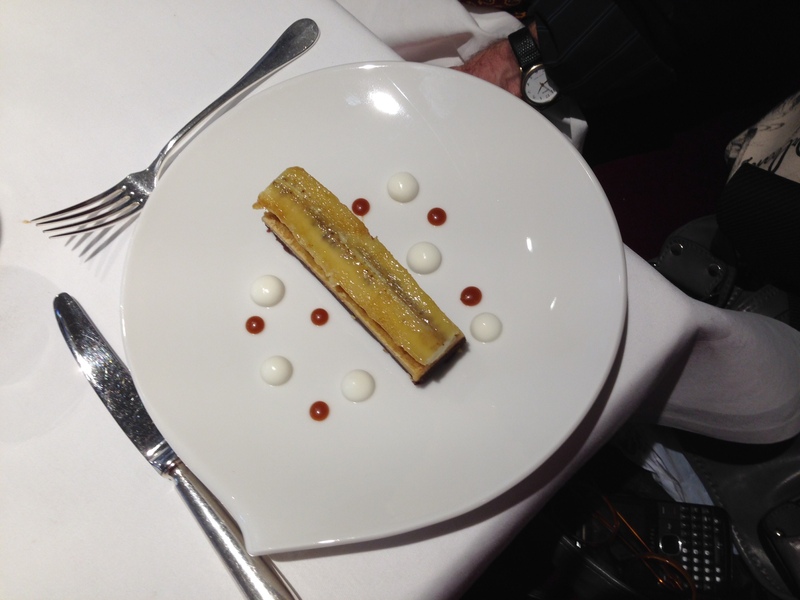 An odd little piece of sculpture for dessert. Under that warm banana is something crispy with chocolate ganache. The dots are caramel and cream. Sigh. Time for coffee. We stroll home in the rain, sharing an umbrella. No longer young, not as acute or good-looking as we once were, having been through a lot, and maybe showing the wear and tear, a simple reality comes through. C’est l’amour. C’est tout.